Balan’s – all seven locations in London – is known for their breakfasts. 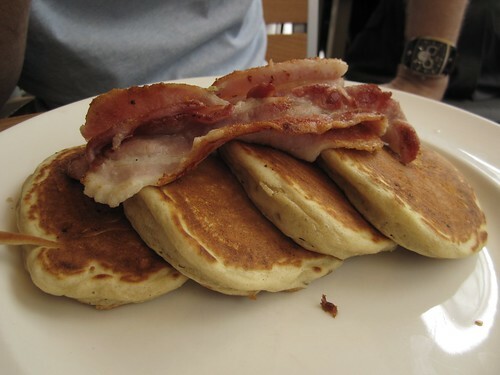 Nice fluffy American-style pancakes, equally fluffy scrambled eggs and streaky bacon. In short: any American in London’s dream brunch. Why then, oh why, do I insist on deviating from the norm and order something not breakfast-y? In this instance, it was because I wanted to be ‘healthy’. I opted for a salad. BIG mistake. 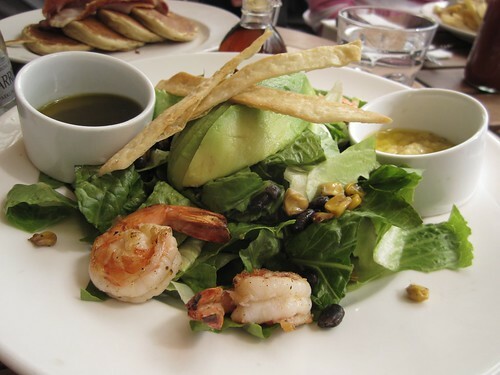 My salad was made up of exactly two prawns, about 10 corns kernals, a sprinkle of black beans and three slices of avocado – all for the bargain price of £8.95. Luckily (sarcasm alert) they did not skimp on the lettuce as the bowl was overflowing with it. I reckon their overheads for this salad was probably in the region of 75p at the end of the day, which really just makes me a chump for assuming £9 would net me more than two prawns. Silly me. On the other side of the health scale were the aforementioned pancakes DQ ordered, which were delicious and everything one could hope for in an American breakfast. Fluffy buttermilk goodness with fresh maple syrup and crispy, salty proper bacon. Well, proper for me anyway. At £6.95, they were slightly overpriced, but certainly didn’t break the bank. You know, I really like the restaurant choices at Westfield, but I’m steering clear of Balan’s for next time. Sorry kids, but even nice pancakes did not erase my hatred of paying £9 for romaine lettuce.